My new found love is the Perfect Pickler and I am so excited to give one away and share this amazing product! See bottom of page for details and how to make my yummy probiotic carrots. There is also a video to watch that will show you how super easy they are to make. I will be teaching two classes this month using the Perfect Pickler. These are hands-on classes where class members will be taking home their own Perfect Pickler filled with vegetables. I will be discussing all the health benefits. We will be sampling a lot of different pickles with yummy Artisan Bread Panini Sandwiches. The Artisan bread is fermented overnight and then baked in a 500 degree hearth oven called the La Cloche. Class 1 will be the probiotic carrots and class 2 will be Kimchi. We will also be learning to make Non-Dairy Almond Yogurt in Class 2. I hope you can join us on April 11 & 25, 2012. You fill the Perfect Pickler with just water, sea salt, vegetables and seasonings and watch the transformation take place. "You can not purchase the nutrients found in fresh, cultured brine pickles for any amount of money, nor find more dynamic supplements. Yet, these ingredients are inexpensive and lie within common vegetables and sea salt. We're not going back, we're coming around to the wisdom of our Elders: make brine pickles a regular part of our daily diet." ~ Bill Hettig, creator of the Perfect Pickler. Minerals: Minerals from both sea salt and within plants become ionized (charged), becoming more absorbable. digestion. Enzymes pre-digest foods during the meal. Microcultures: Multiply by the billions. These beneficial bacteria replenish our own resident cultures. As a probiotic they act to limit pathogenic bacteria as our very first line of immune defense. Fresh brine pickles are both a tasty and healthy treat. Nowhere on this planet can you find better nutritional value than in making your own fresh brine pickles, like those made in the Perfect Pickler. Our entire digestive tract -- from mouth to colon --benefits from ingesting daily amounts of fresh vegetable probiotics. Each bite contains millions of friendly bacteria, the very same that reside in a healthy digestive tract. Fresh pickles (probiotic vegetables) maintain and build upon our own colony of friendly bacteria. Recently, science has found these cultures to be our primary immune function; some say as much as 70 percent.Maintaining a healthy gut culture is the number one way to stay well and vital!! Fresh pickles are a dynamic aid for hard-to-digest foods so common in this age of highly processed food. Ancient cultures learned to combine pickles, relishes, salsas, chutneys and other ferments with their staple foods. When you eat a little pickle with your meal these mighty organisms immediately start the digesting process in the mouth and all the way through to the colon. Micro-cultures produce a complex of B vitamins and vitamin K. They preserve Vitamin C found in the veggies. Pickles kick-start digestion through salivation and enzyme production in the mouth. Certain brine bacteria act as anticancer factors by preventing the formation of chemicals which are carcinogenic. Probiotic-rich pickles are beneficial while taking antibiotics. Micro-cultures develop healthy digestive tracts and immune function in the young. They make low-cost probiotics for daily consumption. They speed up bowel function by improving peristaltic action and reduce transit time of digested food. They play a role in protecting against the negative effects of radiation and toxic pollutants. Evidence is strong that an overgrowth of E. coli in the bowel may provoke a diabetic condition. Resident microflora keep E. coli in check. They help control genito-urinary tract infections. They are an ideal treatment for diarrhea including rotavirus, Clostridium difficile and "traveler's diarrhea" especially pediatric diarrhea - one of the greatest killers of children throughout the world. 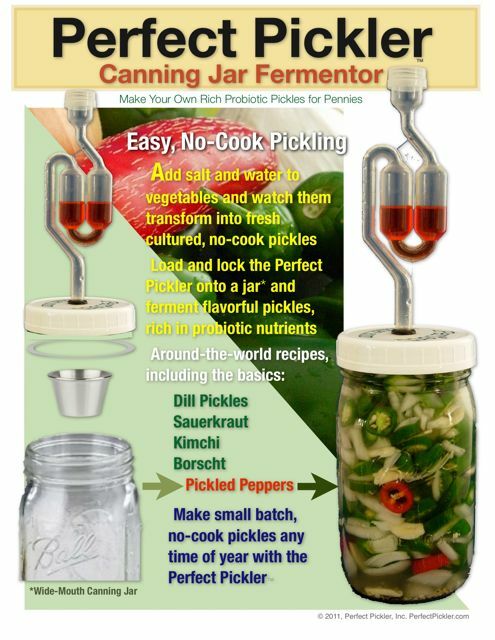 I am giving away a Perfect Pickler through a random drawing next Wednesday 4/11/12. Please leave a comment below and you will be entered into the drawing. The Perfect Pickler Kit includes: Fermentation Lock, Special Wide Mouth Lid, Brine Overflow Cup, Gasket & O-Ring Set, Instruction Recipe Booklet & Celtic Sea Salt. Good luck-I know you will love the Perfect Pickler! Slice carrots and put into 1 qt. mason wide mouth canning jar until you reach about 2 inches from top of jar. In bowl mix 2 cups purified water and 1 Tbsp. Celtic Sea Salt. Let salt dissolve and then add remaining ingredients. Pour brine mixture into jar until you reach about 1/4 inch from the top of jar. Add brine overflow cup so it floats in brine. Place lid on by first twisting on jar counter clockwise until in clicks into place and then turning clockwise to seal. Add fermentation lock. Be sure to add water to the fill mark on the fermentation lock. Place jar in a bowl and place on counter for 4 days. Be sure to mark the date you made the carrots so you will remember when to open them. After 4 days take off lid and fermentation lock and replace with canning jar lid. Place in refrigerator where flavor will continue to develop. Carrots will keep for months (if they aren't eaten before then). My intestines would be so happy if I won the perfect pickler!!!! Love this idea! Heck yeah! Pick me please! I'm really starting to love fermented food. 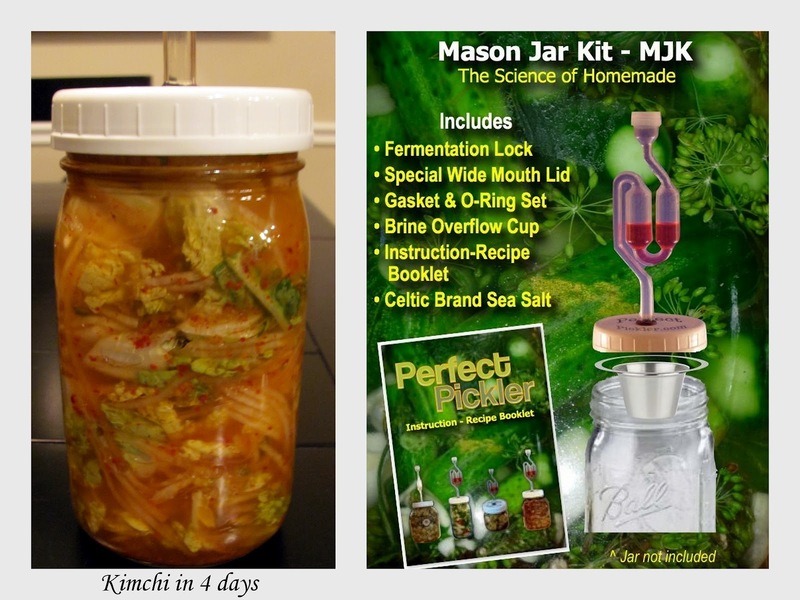 I'd love the Perfect Pickler, I'd use it to make kimchi! I need this so bad! My intestines are in bad shape. I feel great if I won of this pickler but is it okay if it's from another country? I recently just heard about this from a friend... this is my next step to improving my road to health. I would LOVE to win this. I love to make my own fermented veggies and this would make life a little easier doing it. My body loves it when I eat fermented kraut, almond milk kefir, etc. Fermented stuff is so good for you. Thanks for this article. Great! I Want it!!! Enter me! This looks awesome! Enter me please!! This looks like fun and yummy too! Double benefit! Debbie ~ This is fine, fine work. You are a perfect pickler! I would love to win the perfect pickler! I've been trying to ferment sourdough and would love to try fermenting veggies next! This would be phenomenal to have! My husband has been asking me to make him some fermented vegetables and this would definitely make it easy... Thanks! That class is going to be yummy and so healthy too. Looking forward to your classes-they are so great because you do such wonderful research. Please enter me in the drawing. I am studying holistic nutrition and am very excited to make some probiotic veggies! Fingers crossed this Perfect Pickler will be coming to my kitchen soon! When I was growing up my mom served us pickles. A neighbor told her there was no nourishment in a pickle! Little did she know! The whole process and end result looks fantastic. We love pickles! My husband will have to substitute his NO-salt products due to his congestive heart failure. Will that make a difference? I would love to win the pickler. I wanted to let you know that we will not be able to attend your classes this month as we leave tomorrow for Amsterdam, England and Ireland and will return May 5. I hope you will offer these classes in the future as I would be interested in attending. Best of luck with them. You always teach us so much and everything is so delicious. I have been wanting to learn how to pickle veggies for a long time. I would love to learn how to do it. Oh how I would love to learn to do this! I wish I lived closer and could attend your classes! Thanks for the opportunity! Happy Easter! I live too far away to take your classes but I so appreciate being able to use some of your recipes. Thank you for sharing your knowledge about better health! I admire your dedication and generosity; your example makes me want to share more of my talents and make a difference for someone else too. This is the greatest - would love to win one!!! SO glad i didn't miss this giveaway! what a contraption~ can't wait to impress the fam with this one. i have just recently been entertaining the idea of pickling/fermenting vegetables....but am so intimidated!! this would surely be encouraging! thanks for the chance! Pickled veggies don't seem nearly as intimidating with this contraption! I'm a fan of a fool-proof method. Thank you. Recently I attended a chef’s demonstration in the San Francisco area. The chef prepared an amazing delicious dressing using fermented watermelon radishes. In his demo he also talked of other foods that he had fermented. 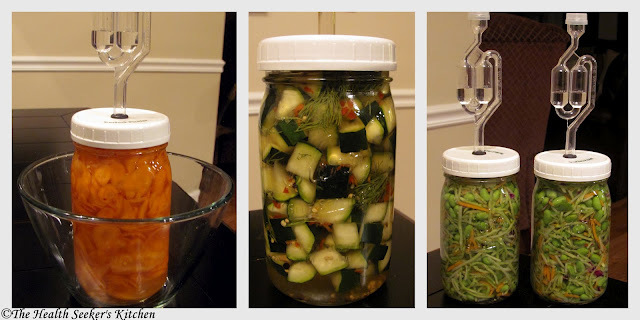 It sparked my interest and I’ve wanted to do more with fermenting. If my husband were given a choice of a serving of ice cream or a dill pickle…he would choose a dill pickle. He loves them. I can guarantee if we receive the Perfect Pickler it will be put to great use! We hope you will consider us in the give away. Thank You. Glad that recently i came to know about this blog, and excited to learn that fermented food is so rich in enzyme. i would like to make more of these foods to give to few pastor's wife and friends who were diagnose with cancer in my country. Most Malaysian Chinese only eat cooked food. with these fermented food i am sure they will be more healthier than before. I can't wait to try out fermenting veges using the Perfect Pickler.